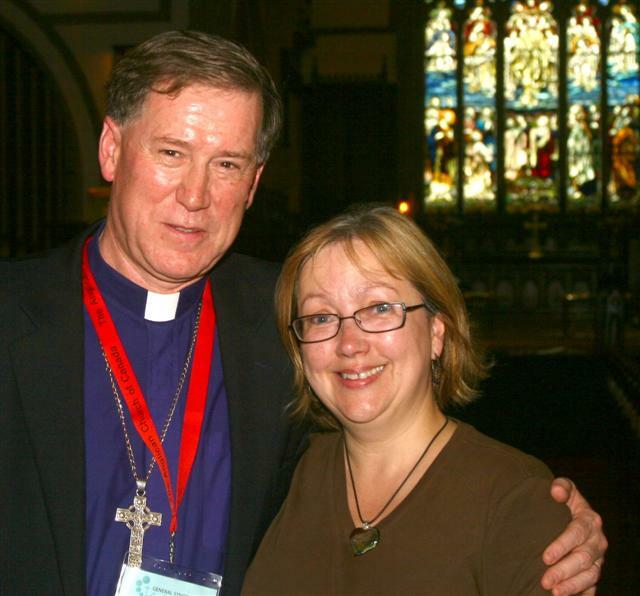 The new primate of the Anglican Church of Canada, Bishop Fred Hiltz, and his wife, Lynne Samways. After a nail-biting election that took nearly three hours, a majority of the delegates of the General Synod elected Bishop Fred Hiltz of the diocese of Nova Scotia and Prince Edward Island as the 13th primate – or national archbishop – of the Anglican Church of Canada. Bishop Hiltz, 53, was elected on June 22 on the fifth ballot, garnering 60 out of 116 votes (51.7 per cent) from clergy, and 81 out of 137 votes from laity (59 per cent). Bishop Victoria Matthews of the diocese of Edmonton came in a close second, with 56 votes from clergy, and 56 from the laity. Amid the sweltering summer heat, delegates cast the first ballot at 11:07 at Holy Trinity Church, an inner city parish in downtown Winnipeg. Delegates were nearly faced with the prospect of having the house of bishops make the final decision on the new primate when both houses of laity and clergy were split on their choice for primate. On the third ballot, Bishop Matthews received a majority of the votes from clergy (62 out of 115) and Bishop Hiltz received 53. Fifty-nine votes from clergy were needed to win the election. Bishop Hiltz, however, received a majority of the votes from laity – 73, compared to Bishop Matthews’ 64. Seventy lay votes were needed. On the fourth ballot, the deadlock between the choices of clergy and laity remained. The members were informed that if the stalemate remained on the fifth ballot, the decision of choosing the next primate would fall on the bishops, who were sequestered in a nearby hotel. Two motions from the laity and later, one motion from the clergy, asking the house of bishops to add another name to the list of candidates were defeated. Delegates jumped, cheered, hugged each other and when at 1:56 p.m., Dean Peter Elliott, General Synod prolocutor, announced, “My brothers and sisters, you have done your work. We have a new primate.” Members sang the Doxology, a song of thanksgiving and the church bells were rung. Moments later, Bishop Hiltz was escorted to the main door of the church by his predecessor, Archbishop Andrew Hutchison, and was met with a rousing welcome by delegates who stood from their pews to greet him. “My brothers and sisters in Christ, thank you for your welcome. Believe me, it’s helping me to relax,” Bishop Hiltz said as he was presented to the delegates. “I was in quite a state coming through the front door.” As he was led through the main door Bishop Hiltz’ lips quivered at the sight of his wife, Lynne Samways, who approached him with tears in her eyes. The primate-elect also spelled out the other priorities of his primacy: getting to know the churches in Central Canada, in the West and in the North, more support for the Council of the North (composed of 11 financially-assisted dioceses in the North), and the deepening and broadening of the church’s relationship with the Evangelical Lutheran Church in Canada, which is in Full Communion with the Anglican church. In 2004, Bishop Hiltz’s fellow bishops selected him as a candidate for primate, but he declined the nomination, saying he did not feel he had all the necessary skills to be the national leader and felt a commitment to a diocese undergoing a period of transition. This year, however, he said he has had three additional years of experience, the diocese is on a firmer footing and he and his wife are more comfortable with the idea of moving to Toronto, where the seat of the primacy is located. Bishop Hiltz, who is known for his quiet demeanour, succeeded Archishop Arthur Peters in 2002 as the 14th diocesan bishop in the oldest diocese (founded in 1787) in the Canadian church. It is preparing to celebrate in 2010 the 300th anniversary of continuous Anglican worship in the diocese and will host that year’s meeting of General Synod in Halifax. In the past three years, Bishop Hiltz led the Leap for Faith capital campaign, which has collected $2.8 million of its $3-million goal to benefit youth ministry, congregational development, communication and organizational effectiveness. He is a former member of the national faith, worship and ministry committee and the Council of General Synod. Born and raised in Dartmouth, N.S., Bishop Hiltz graduated from Dalhousie University with a bachelor of science degree in biology in 1975 and from the Atlantic School of Theology with a master of divinity degree in 1978. He was ordained a deacon in 1977 and priest in 1978. He served in a number of parishes within the diocese: Christ Church, Sydney; Melford-Guysborough; Timberlea-Lakeside; All Saints Cathedral, Halifax; and St. John’s, Lunenburg. In October 1994, he was elected suffragan (assistant) bishop of Nova Scotia and Prince Edward Island and in 2002 was elected co-adjutor bishop (assistant bishop with the right to succeed the diocesan bishop) on the first ballot by a 75 per cent majority. He and his wife have one son, Nathan, who is a musician in Toronto.